Every year over 2,000 Christmas Markets pop up all over Germany. Which means that’s a lot of Christmas Markets to choose from! There’s been a lot of coverage devoted to many of the large Christmas Markets in the country, but today I want to highlight 5 underrated ones to add to your list! About an hour’s drive north of Frankfurt is the small town of Marburg which hosts two Christmas markets. The first is located in the Old Town, which features half-timbered houses dating back to the 14th Century. The Christmas market itself is small but charming and has food, gifts, and of course Gluwein to enjoy. The second market is located at St. Elizabeth Church. Wooden cabins circle the church grounds and you’re able to take in the festive time of year without all the crowds. Situated where the Rhine and Moselle Rivers meet is Koblenz, one of Germany’s oldest cities. 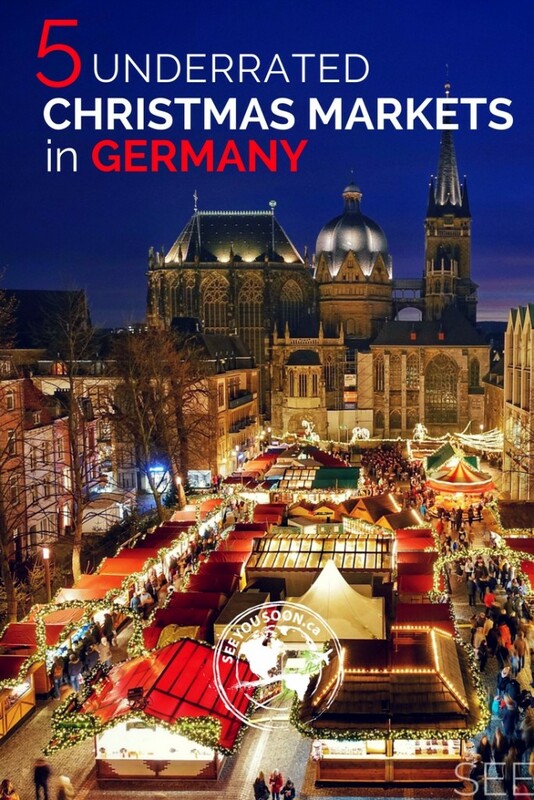 Here, the Christmas market can be found in 6 different locations within the old city centre. Local craftsman sell one-of-a-kind gifts, perfect for that special someone back home. Each area has it’s own vibe and tasty treats to enjoy and makes for a romantic evening once the sun goes down. For something very unique, head to the small village of Morz. This Christmas market only happens for one weekend every year and is truly the definition of a traditional Christmas market. The market takes over the whole village and features goods and foods made by the local inhabitants. It’s really something special and as authentic of an experience as you can get today. On the western side of Germany, bordering Belgium and the Netherlands is Aachen. This Christmas market has been running for over 40 years and takes up the entire area around City Hall and the Cathedral. More than 120 stalls set up shop, many of which are run by local businesses and food vendors. One thing you can’t miss while you’re here is Printen, a gingerbread like sweet that originated in the city. There’s a number of varieties and it makes for a perfect gift to take home. If you have time, pop into City Hall where you can get an elevated view of the Christmas market from the second floor windows. If you want the big-city Christmas market experience without being in a big-city, head to Heidelberg. More than five market squares in the historic centre transform into magical Christmas markets with over 140 wooden stalls spread out amongst them. There’s a wide selection of crafts on display along with regional cuisine to indulge in. Children can enjoy the ice skating rink and carousel while adults can stroll hand in hand with a mug of gluwein. Do you have a favourite Christmas Market in Germany? Let me know in the comments below!